The British Expeditionary Forces where driven out of France in 1940. Right after that the Battle of Britain was fought in the Air over the Canal and Southern England. Once that battle was won, it became certain that the Allied Armies would return to France, the only question that remained was when. COSSAC ( Chief of Staff to the Supreme Allied Commander) was created in England with The British general F. Morgan as it's head. It was their job to prepare a plan for the landing in France. They set the initial date on April 1st 1943. They calculated that 48 infantry divisions and 6000 airplanes where needed for the invasion and the build-up that would follow the invasion. At that time it was still uncertain if the Soviet Union could stop the German advance and the planners kept the possibility open that they had to make an early landing in 1942. 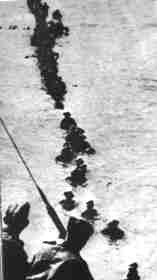 Churchill strongly opposed such an early landing. He proposed to drive the Germans and Italians first out of North Africa. This gave the American forces the opportunity to get their first experiences with amphibious landings. The landings in North Africa mean that the landing in France in 1943 was no longer possible. Pressure from Stalin forces the Allies to make haste with the preparations. The star of General Dwight . Eisenhower had risen after he had successfully lead the landings in North Africa and Sicily so he become the commander for the operation that at that time received the codename "Overlord". However he will not have the command on the day of the inva sion. That task wekt to field marshal Montgomery. This situation in which a general outranked a field marshal was typical for the fragile political situation between the allied forces at that time. General Eisenhower would later be known as "the diplomat general" for his tremendous work in keeping the men under his command focused on the job that had to be done, namely liberating Europe. Eisenhower arrived in London in early 1944. COSSAC than changed into SHEAF (Supreme Headquarters Allied Expedition Force). Eisenhower brought his own staff with him and Lieutenant general W.B. Smith become the chief of staff. Morgan then become the assistant chief of staff.